Iditarod 2008 is done - it's Mackey. Iditarod 2008 is done – it’s Mackey. Well, just as I was winding down and about to go to bed, the news comes in. Lance Mackey wins the 2008 Iditarod. What an amazing achievement! He won the Yukon Quest and the Iditarod last year, and repeated both wins this year. 1100 miles down the frozen Yukon River, and virtually the same set of dogs wins the 1000 mile Iditarod. They said nobody could ever win both. He won both in 2007 and just won’ em again. Congrats Lance. Jeff King, 4-time winner, is about an hour behind, and looks set to take 2nd place. PS – Here’s a Photo of Lance in the 2009 Race. This entry was posted in Adventures, Alaska, Anchorage, Iditarod, News, People, Winter on March 12, 2008 by Carl D.
It is an amazing achievement. Didn’t he have some kind of cancer at one time? Great race!! Beth, he did battle throat cancer a few years ago. Winning both those races back to back years is an increditble feat! woo!!! we’re watching it rite now!! Thanks – pretty awesome race, eh? 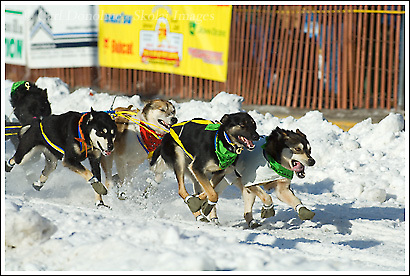 I´ve read a lot about Iditarod, although it´s quite a long time ago this year. I´ve got a question: What´s about Sigrid Ekran? In a newspaper I read she´s the winner of Iditarod, but you mentioned another name, so I´m really confused now. Maybe I´m to stupid to understand, because I´m not from Alaska. Nevertheless, please help me!!! I’m not sure about Sigrid. Wasn’t she in the Rookie, or junior, event? Yeah. She was in the Rookie event!!! !